Bungie is constantly working on tweaks and improvements to their first post-Halo title and major investment Destiny. They have stated plans not only to keep the game itself alive for a long time, but to make sure Destiny as a franchise lives on for 10 years at least. For a new IP, these are big words and demand a lot of work from the team behind it. They managed to complete the first steps quite successfully. The hype, the pre-orders and the initial stages after launch must have been going according to their plan, as they broke records all over the board with huge sales and millions of people playing every day. Of course there were bugs and issues, but as the Destiny forums filled up with questions and bug reports, patches and updates rolled out to get them fixed. Some bugs are still present, but at least they are taken seriously, and the game seem to have a fair share of dedicated players returning to the game on a regular basis. With this in mind, the first expansion The Dark Below is on its way and will be available in mere hours. And with it comes some changes, both to how equipment and weapons are upgraded and acquired, and how the game it self works and plays. Some of these have been in the works for quite some time and players have been prepared. Some updates players were hoping for, are still missing, like the option for matchmaking in raids. Bungie have their reasons for this, and have stated that they have noted the players wish for this feature, but it will not be implemented, yet. The raid remains an arena for teamwork and cooperation. Random players leaving you hanging mid way is not something they want to see. Opinions are probably divided among players, but it remains to be seen how the lack of features and the addition of other changes will play out over time. As the first of 2 expansions in the Season Pass, The Dark Below brings a lot of new content. Most anticipated is the brand new Raid, Crota's End, but strikes, new maps in the Crucible and additional story missions are also included, all of which brings more loot to the table. Other notable changes are the fact that the Heroic Strikes and the Nightfall will be available at level 30 to accommodate the new level cap at 32. As somewhat of a bonus, the Iron Banner opens up again on December 16th, and will have equipment at level 31 available for winners. This time, unlike in the Vault of Glass, you will need to play it in order to get the answers to the questions the story line poses, Bungie is trying their best to listen to the criticism they have been getting for the lack of story in the game this far. With new story missions and the raid as the end part of it, they hope to silence some of this. Destiny is a grind for loot, it is some of what brings players back in over and over again. Many players have started to get quite the collection, and have spent hours getting their hands on all the resources needed to upgrade their favorites to the max. Some of this might now be in vain, as new upgrades and mechanics to get them changed with a recent update. Exotic equipment will get a new upgrade cap with the expansion, going from 300 to 320. To acquire this, you will have to purchase and upgrade from the weekend vendor, Xur, he will have some available for select items each week. By purchasing an upgrade for your gun, you reset the current upgrade progress, meaning you will have to start from scratch. The old upgrade materials are no longer required, in order to max it out you will now need a new material called Exotic Shards. 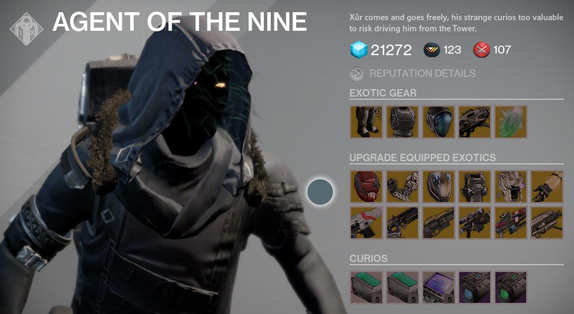 Buy them from Xur for 7 Strange Coins or get them by dismantling other exotic pieces. Legendary gear will still utilize old upgrade materials and will get better stats. But they will still never be as good as Exotic or Raid equipment. If you want to purchase Legendary items in the Tower it will now require a Crucible or Vanguard Commendation. These are received in Reputation Reward Packages delivered by the Postmaster upon reaching a new Reputation Level. According to Bungie, a lot of new weapons and equipment will be added to the game. Basically this gives players more currencies to keep track of, and more use of Strange Coins. The grind continues. Crota's End will be unlocked for level 30 players at 1am Pacific time tomorrow, December 9th, while the harder mode will be saved for later. It is scheduled to be open sometime in January, and this is when players get the chance to have primary weapons rewarded, as these are not dropping in the Normal raid. Another big difference this time, is that the game will recognize the loot you have, and reward you thereafter. The drop rates are also supposed to be increased. You have much less of a chance of ending up with 9 helmets and no boots in this raid and I'm sure a lot of players are very thankful for that. To upgrade your new raid gear you will need Radiant Shards and Energy, earned in the Raid. The Raid gear will have more and better perks this time, and will also produce Radiant Energy or Shards when dismantled. Time to level up again, Guardians. Are you ready? Will you be standing at the gate, ready to embark on the challenges the new Raid have for you? Aiming for to complete it as the 1st in the world maybe? What are your views on the changes made?